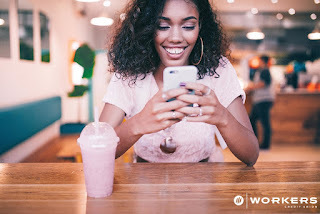 Workers Credit Union Blog: Workers CU Mobile App Upgrade – Coming Soon! Workers CU Mobile App Upgrade – Coming Soon! iOS (Apple) Log Out Link Placement: The Log Out feature has been moved from the More page to the top of the Accounts page and the More page, allowing you to log out faster and easier! Quick Balance, Widget and Android Wear Update: We have enhanced the Quick Balance, Widget and Android Wear functionality to allow members to reorder and hide accounts across all three features. Update Android Navigation Menu Options and More Screen Labels: For consistency between both Android and iOS platforms, we have updated the Android navigation menu to closely match the iOS menu’s look and feel. Locator Search Enhancements: We have added the ability to search new regions by panning the map area and tapping the “search this area” button. Note: Upon upgrading the Workers CU mobile app, some users may be prompted to re-enable the Touch ID functionality. Don’t have the Workers CU mobile app? What are you waiting for? Download today by visiting the Apple App Store or Google Play Store! You are doing right things guys! Almost everybody using mobile apps to buy or find needed information now. We are doing mobile app for thesis help website now. so i know how hard it is to optimize everything! So good luck to you in this complicated process. The faster your business application hits the market, higher would be your ROI. In this manner, focus on picking versatile application advancement organizations that convey top notch applications rapidly, while remembering the changing patterns in the application improvement advertise.